WASHINGTON (Jan. 16, 2009) -- As the nation prepares to welcome a new president, the Army stands ready to assist civilian law enforcement and first responders inside the National Capital Region. While military participation in the Jan. 20 inauguration is largely ceremonial -- a full 2/3 of military members involved in inauguration-related activities will be involved in the parade or other ceremonial events -- another 2,500 military members are on standby to provide support if things go wrong. Sgt. 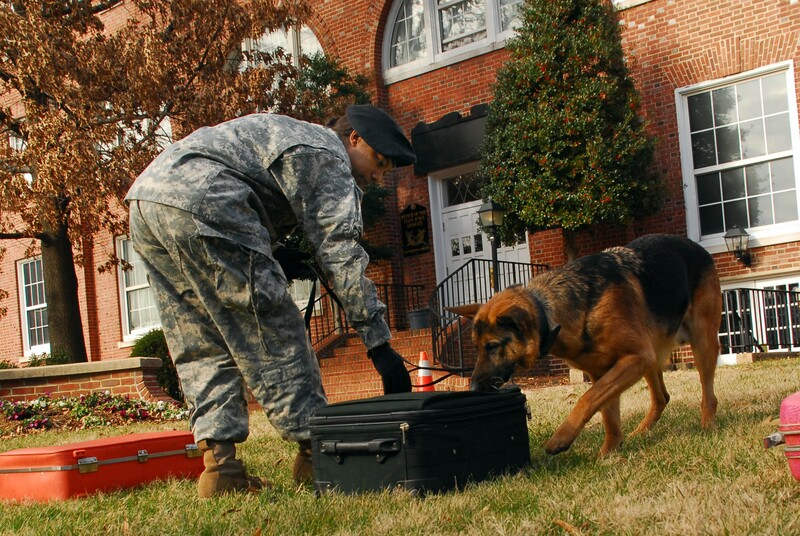 Malkia Litaker, with the 947th Military Police Detachment at Fort Myer, Va., and her military working dog, Gerko, work together to find simulated explosives during a demonstration Jan. 14 at Fort McNair, Washington, D.C. The team will assist in providing explosive detection capability during inaugural events in the nation's capital. Litaker said Gerko can detect up to nine different chemical scents that might indicate the presence of explosives. Soldiers from the Army's 911th U.S. Army Technical Rescue Engineer Company out of Fort Belvoir, Va., for instance, are poised to help first responders rescue those trapped in collapsed building should such an incident occur during inaugural activities. "If a building were to fall down, we'd go in to shore it up and basically stabilize the building," said Sgt. Robert Huffman, 911th EC. "If the air is bad we're going to go in on air, if not just with respirators -- whatever we need to do to extricate the people. It's very similar to what firemen do." Huffman, who's been in the Army going on four years now, says the 911th EC uses tools like concrete saws, wood chainsaws, torches, exothermic torches, breathing apparatus, shoring equipment and trenching equipment to conduct their rescues. The 911th EC trains with state, local and federal agencies, to include the Federal Emergency Management Agency Urban Search and Rescue Teams, to develop and maintain the most advanced skills in the field. "We always try to simulate real-world emergencies with the force," said Staff Sgt. Donald Nolan, 911th EC. "We use fog machines to simulate smoke, and our confined spaces and collapsed structures are all mock -- so there is no risk. But out Soldiers go through crawl, walk, and run stages with training. It's all very intensive and it takes months to hone." Participating Soldiers from the 911th EC will be stationed in and around the National Capital Region waiting to assist. "We're posted at a heightened state of readiness -- on order to deploy and conduct technical rescue if needed," said Capt. David Dietz, commander of the 911th. He said his unit will have a "fairly robust package" of assets available to provide support to civilian agencies if they are tasked to assist. Sgt. Malkia Litaker, with the 947th Military Police Detachment at Fort Myer, Va., is one of many Army military working dog handlers who will be tasked to augment security during inaugural activities. Litaker and her military working dog, Gerko, work together to seek out potential explosives. She said Gerko can detect up to nine different chemical scents that might indicate the presence of explosives. "We make sure everything is safe for all the people in the area and the president," she said. "We are just doing detection." Prior to the inauguration, Litaker said she didn't know exactly what kind of support she'd be asked to provide, but she remembers the last inauguration she worked -- in January 2005 and expects to do the same kind of work this year. "Last inauguration we were at the convention center, we swept the entire convention center for explosives," she said. "The last inauguration -- it was a lot of fun doing that, and I was glad to be part of that -- this one too." Servicemembers from the Army, Air Force, Marines, Navy and Coast Guard are all participating in the inauguration as part of Joint Force Headquarters - National Capitol Region. The headquarters acts as a single point of contact between the capabilities of the armed forces in the NCR and civilian law enforcement, first responders, and other federal response agencies. "Our medics who will be out supporting the parade along the parade route, will be able to respond to a situation in support of the incident commander very quickly," said Maj. Gen. Richard J. Rowe Jr., commander of both Joint Force Headquarters - National Capitol Region and the Army's Military District of Washington. Rowe also said JFHQ-NCR provides a chemical, biological radiological, nuclear and high-yield explosive consequence management capability to the inaugural events, including the Marine's Chemical Biological Incident Response Force, II Marine Expeditionary Force. The general said the 7,500 servicemembers in JFHQ-NCR have three roles during the inauguration, including providing ceremonial support, providing specific DOD capabilities to federal agencies in charge of inaugural events, and being prepared for a consequence management requirement should something happen that causes people to be injured. Rowe said the JFHQ-NCR is ready to provide whatever support is needed for the inauguration -- mostly because servicemembers have practiced for the many possibilities that could happen. "We have every two weeks a tabletop exercise that takes a look at our region, takes a look at a situation: infrastructure collapse, train derailment, loss of power supply, communications incident, incident within Metro, crowd control, crowd management incidents, medical incidents or contaminants," he said. "You have to force yourself to try to think through what some people might say the unthinkable -- but to try to think what combinations of things could happen. We are very well prepared. We are ready to do a wonderful event. I believe our head is in this, we are committed to this, and we are prepared."